Lift heavy? Then you probably need a good pair of weight lifting gloves. You don’t want to be left with unsightly calluses all over your palms. On top of that weight lifting, gloves have many other benefits such as giving you better grip and it will probably help you life heavier. However, before you dive straight in, there are a few things you need to consider before you buy the first pair you see. Also, if you like this post, you may also like 10 best weight gainer proteins. How do you choose the best weight lifting gloves? Value for money – Ok, let’s be honest. At the end of the day, they’re just gloves. It’s silly and unnecessary to overspend. Of course, quality is important, but it must also match the price. Style – If you’re going to be wearing it often, then you want it to look good. Why not? The gloves should not be something you’re embarrassed off, rather something you want to show off. Comfort – Weightlifting gloves can have all three attributes above, however, if they’re not comfortable, there really is no point. You want them to feel good when you put them on. You don’t want something you can’t wait to take off at the end of a gym session. These gloves by Trideer offer good value for money. They are lightweight, offer a good grip and are fairly durable. The silica gel palm offers a great grip and protects you from injury. The Velcro straps are also good for wrist support. 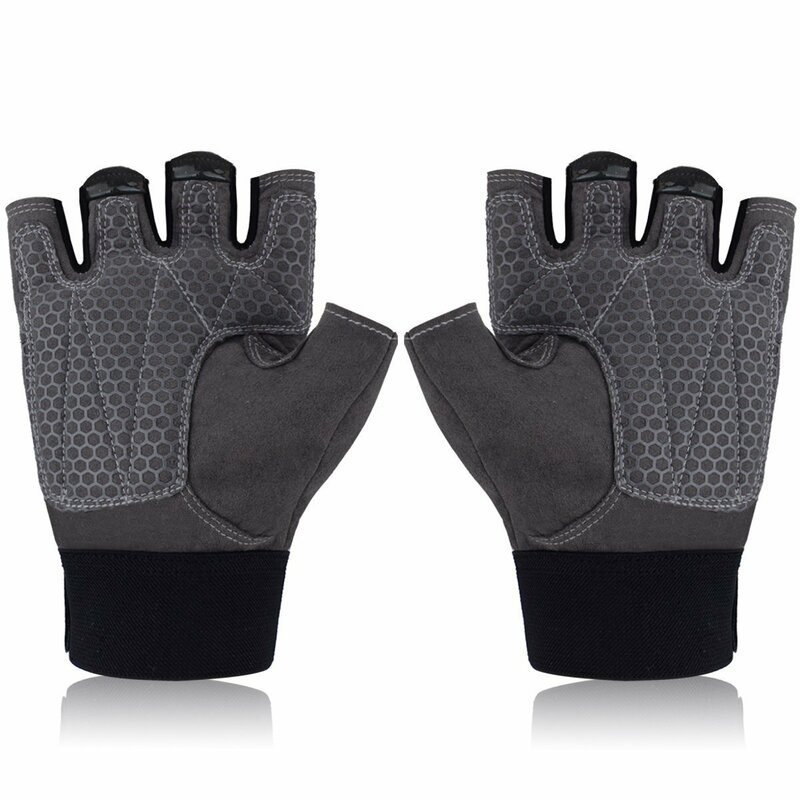 The weight lifting gloves come in black and grey, so you can choose a style that suits you. Another customer says that he’s compared a few different gloves online, and these ones are his favorite. The material and stitching feels well made and looks like it will last a while. These weight lifting gloves by Fit Active Sports have a ‘not so typical’ look and design to them. However, they do seem like they would still work pretty well. They have built-in wrist straps which should provide you with excellent grip. The wrist straps are built around the idea of comfort, so they can be tightened and loosened depending on your preference, also since the top is open, you will sweat less and have more ventilation. Another customer says his favorite feature is the back of the glove as it is ventilated which allows his hands to sweat less. He also says they are rather loose so you should probably get a size smaller than your regular. If you want something that simply does the job, then these gloves may be for you. These gloves by Contraband Black Label offer no overly designed features or fancy straps. Just good value for money, simple, lightweight gloves. The palm of the gloves is made out of leather which ensures the gloves last as long as possible when using them to lift. One customer says that the glove fits like any other glove you would normally buy. The customer also says weights feel so much lighter with these gloves on. Another customer says that these gloves offer the best value for money. Another customer was not so happy with these gloves. This customer says that the gloves tore after 2 months of use. Which he is not happy about. He expects them to last longer. Another solid pair of gloves by Trideer. These gloves are all-purpose gloves. You can use them for lifting weights, cross-training, and other gym workouts. The gloves give you a really great grip since they feature silica gel palm. The gel palm also protects from injury. The 18” wrist straps allow you to adjust the gloves to give yourself the support you need. One customer says these gloves are a really good choice. He says the wrist straps are useful since they protect you from sudden movements. Another customer says the gloves fit well and are sturdy. The customer says if you’re a gym junkie, go for these. Another customer says that these gloves are perfect for him. However, one thing he doesn’t like is the palm gel is a bit too thick. Which makes gripping heavyweights slightly harder. These gloves by RIM Sports are lightweight, weight lifting gloves which have a number of features which make them great gloves. The fabric is soft and breathable, the Velcro strap is also in a diagonal position, this allows good flexibility and movement. The gloves also aim to be extra durable, with the double stitching that prevents easy breakage. One customer says these gloves are great. They don’t get stretched out easily and there no seams in unusual places. Another customer says the gloves are great for weightlifting. They give him the grip he needs and protect his hands from blisters. These weight lifting gloves by Trideer are breathable and lightweight. They also look pretty good. With these gloves, you get protection on both the front and the back of the gloves. The gloves are built with high-quality material which is made to last. The silica gel is also present in these gloves to give you the protection you need. One customer says these gloves work for lightweight workouts, if you plan on going heavy then you probably will be better off with something else. Another customer says these gloves look good. They also offer sufficient protection and are durable. Another customer says that if you want a good fit, order one size down. Other than that the gloves work as expected. The Harbinger Pro weight lifting gloves feature integrated wrist straps which stabilize wrist joints, which offer stabilization for when strength training. The gloves are built to be durable and should last you a long time. If not, they come with a 90-day manufacturers warranty for extra piece of mind. The cushioned leather palm has open cell foam which is good for ventilation. Also, the half finger length allows you to have more contact with the weights for a better grip. One customer says the gloves are built from quality material and they fit well. However, it would have been better if the wrist strap around the glove was made out of stretchy material. Another customer says that gloves really feel great on his hands, however, the Velcro started falling apart after a month which was really disappointing. These weight lifting gloves by Evo-2 have integrated wrist straps, this, of course, gives you that added wrist support. The gloves also feature double stitching for increased durability. The palm of these gloves is Anti Slip. This really helps by giving you the maximum grip possible when lifting those weights. One customer says these gloves are perfect for him. He says he had them for a while and they really seem to pass the test of time. Another customer says that these are the best gloves he has ever used. The customer says he loves the fact that the gloves are easy to take off and the colors don’t bleed. These weight lifting gloves by Nordic come with 12” wrist straps. These allow you to adjust the wrist strap depending on how much support/ flexibility you need. The product is suitable for weightlifting, cross training, and other general gym workouts. The price is also reasonable. One customer says these gloves are great, he says he uses them regularly for rigorous lifting. And so far they still intact. Another customer says that he loves the adjustable wrist strap. He says, depending on what exercise you are doing, you are going to need to adjust the wrist support. And these gloves facilitate for that. These gloves by Harbinger come in a sleek simple design. The stretch back mesh offers a flexible and comfortable fit for the gloves. The gloves also have a leather palm. This is great for giving you a great grip while protecting your hand from blisters and calluses. One customer says that these gloves are not very durable. The customer also says too much dye was used in the gloves. This left residue on his hands. Another customer actually really liked the gloves. He says they are inexpensive and seem to do the job. Another customer says he would not recommend these gloves. He says he has used them about 10 times and they are already starting to rip.